Trees and large shrubs require substantial amounts of water which is collected via the tree’s root network. As a result of growth or the need to find more moisture, this root network can extend many metres from the trunk of a tree and can grow under the foundations of buildings and walls. 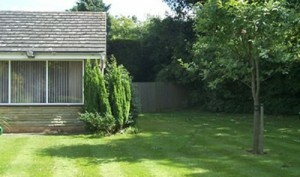 This can cause subsidence on properties, particularly properties built on reactive clay soils. As moisture is extracted from the soil by the roots the clay ‘shrinks’. If clay shrinkage occurs beneath the foundations of the building, this will induce subsidence on the property. A common solution is to remove the tree. However, due to technical and legal reasons this is not always an option. A root barrier will allow trees and other vegetation to remain whilst ensuring that they will not have an impact upon an adjacent property. Cheaper than underpinning for most cases. 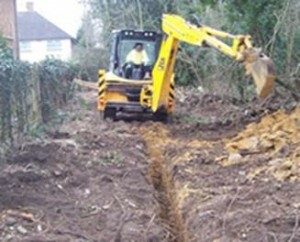 A root barrier is installed within a trench. 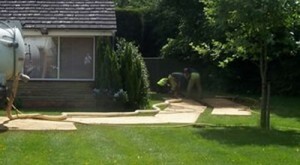 A suitable membrane is utilised to act as a barrier between the vegetation causing the damage and the property. This will be installed at sufficient depth to ensure that the roots of the vegetation no longer impact on the building and will be unable to in the future. The siting, depth and components of a root barrier are all dependent upon final design. Greenleaf Innovations are happy to assist in this regard, with fifteen years’ experience of designing and installing root barriers, or we can install a root barrier to your design. Trench – the excavation needs to be correctly positioned and long and deep enough to sever the roots affecting the building. Membrane – this comprises a specialist geo-membrane for ease of installation, durability and minimum impact at ground surface level. 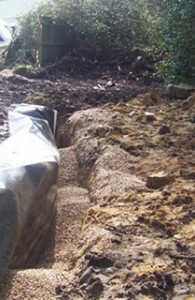 Fill Material – suitable backfill is emplaced to protect the membrane, minimise settlement problems and provide a sump area to reduce the risk of roots seeking to grow around the barrier. The installation of the tree root barriers can be disruptive to the site. A mechanical excavator is normally used, as often we will be required to excavate several metres of trench to 2-3.0m depth. For many clients it is preferable to use a ‘hydrovac’ as an alternative. This piece of specialist machinery uses water jets and suction to cut a narrow trench for the installation of the barrier. This method will ensure that any disruption from the installation if minimised and that your property is left as tidy as possible during and upon completion of an excavation. See figures 2-4. A 100% safe method of digging. Hydrovac excavation eliminates the risk of strikes on services. A neat and minimal trench of roughly 6 inches wide. Minimal ground disturbance around trench. Allows roots in trench to be cut cleanly whereas tearing damage caused by an excavator could cause infection to spread up the roots. Overcomes access issues as the truck can operate about 30 metres away from the excavation. Minimal collateral damage to lawns/area where root barrier is being installed due to tracking of vehicle. Capable of installation in areas under walls and with awkward shape/lines. If you believe that a tree root barrier could be of benefit to you or a client then please contact us via the contact page, phone on 01454 324807 or email contact@greenleafinnovations.co.uk We look forward to talking to you.